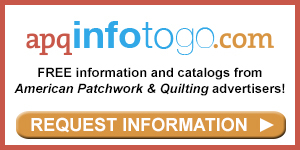 Hit the Road with American Patchwork & Quilting! This is the time of year where the weather’s getting nicer and everyone starts planning their summer vacations! Whether you’re planning a big getaway with the whole family or just want to fit in some smaller day trips with your girlfriends, we have some suggestions for how to fit sewing into your travels! From museums and quilt shows to explore in your area to must-have travel essentials, quilting buddies Lindsay, Elizabeth, and Alison shares their best tips for making quilting part of your summer travels. Listen to the show in the player at the end of this post. Subscribe to the free show on iTunes, Stitcher, or Spotify here. Lindsay, Elizabeth, and Alison take periodic day trips to Winterset, Iowa, which houses the Iowa Quilt Museum. Each quarter, the museum switches exhibits, so it's easy to plan a trip around that schedule. They see the museum, grab lunch, do some shopping at the local quilt shop and antique stores, and enjoy the day! Is there a museum in your area? Check out our list here, then plan your next getaway with friends! In May, our staff is heading to Kansas City, Missouri, for International Quilt Market. This Market is the closest to us (only a few hours south), so it’s fun to be able to drive for this trip. 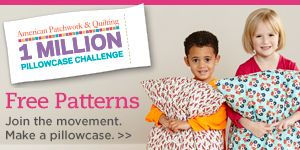 At Quilt Market, our editors and designers visit for 3-4 days. We attend classes about the newest products and fabrics, see trends in the industry, scout out new designers and quilt shops we may want to work with, see upcoming fabric lines to use in projects and color options, and catch up with quilty friends. Also, we have a booth to hand out magazines and information, and every spring, we also do a little presentation for the Quilt Sampler shops in the next two upcoming issues! Quilt Market isn’t open to the consumers, but here are some upcoming quilt shows to check out! Traveling with Family? 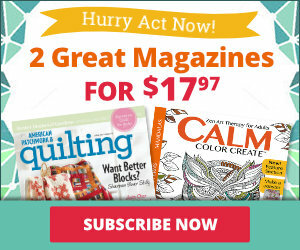 Squeeze in Some Quilting Time! While you're traveling, bring along a project to work on! EPP, hand-piecing, hand-quilting, binding, hand-applique are all fun projects you can do while sitting in the passenger’s seat, or in the hotel at night while visiting with your travel partners. Lindsay purposely tries to get a lot of her piecing/quilting done during the winter, so she has a stack of binding ready for any road trip that pops up. We also suggest having an on-the-go project bag ready to grab! Store an extra set of supplies (pins, needles, snips, thread, etc) and a project, so it’s all in one place and easy to pack. We’ve talked about a lot of realistic ways to fit quilting into your summer travels, but now we wanted to dream a little! Think about your dream quilting locations – it can be a quilt shop you’ve always wanted to visit, a retreat location you aspire to, or a show or event that’s on your bucket list! Elizabeth dreams of visiting Australia to visit Jen Kingwell's quilt shop; Alison wants to visit Sisters, Oregon, to see the Outdoor Quilt Show; and Lindsay wants to take a trip to Missouri Star. Of course, we can’t talk travel without talking about our Quilt Sampler magazine – the next one hits newsstands May 10, 2019! 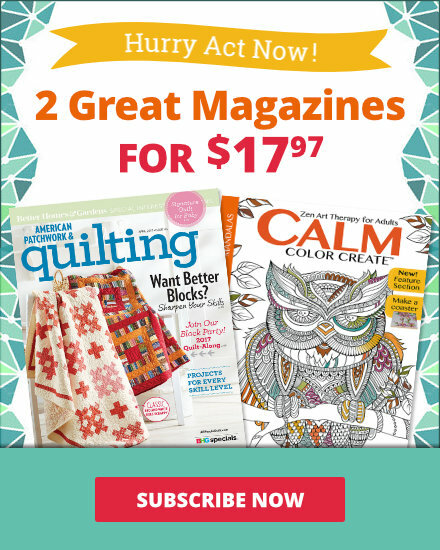 If you’ve never heard of Quilt Sampler, it’s a magazine we publish twice a year that features 10 quilt shops, each of which shares a quilt prattern with our readers! If you're traveling, you can use our website to find a list of featured quilt shops by region here.